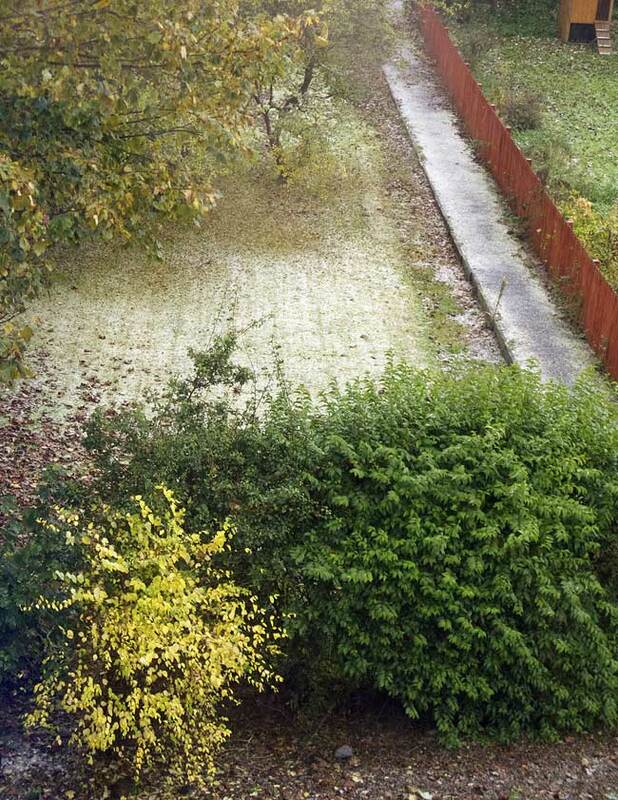 So here we are, the clocks have gone back and winter is suddenly standing at your elbow like a grinning lawyer who already knows you’ve been left out of the will. Whichever way the clocks go, back or forward, I always feel jet-lagged; even the extra hour in bed’s a swindle as I just end up lying awake wishing I was asleep. Bah. And possibly even humbug. Next up—Halloween, that ghastly festival where you glumly sit perched on the edge of your sofa, unable to relax, waiting for the scuffle of childish feet on the gravel closely followed by licensed extortion with menaces (this is probably how Terry Pratchett’s Thieves’ Guild started). I imagine that the experience of living through the Blitz, listening to the German rockets overhead and wondering if this time they’ll land on you, must have been uncannily similar. As I mentioned last week, my third novel, The Wraiths of Elfael, is now launched on an unsuspecting world. I’ve been comparing my feelings to those of an anxious parent sending their not-especially-bright child off on their first day at school, expecting them to come back with a nosebleed and a black eye after being beaten up by the rough kids. But thinking it over I don’t think I need worry. Just one look at the cover tells you this is a book that can look after itself. I’ve written a short piece about the origins of the story and some of the background—if you’re interested, you can find it here. It’s a winter’s tale, full of ice and snow and wolves and dark magic, the first part of a trilogy. It’s going to be free on Amazon from Monday through Wednesday, and will be joined on a free promotion on Wednesday by my other two novels, my contribution to the Halloween spirit. As ever, any promotion you can do to let people know it exists via Facebook or Twitter—and if you should happen to read it and enjoy it, an Amazon review—would be greatly appreciated. When I can get my fingers warm enough to knit—mainly by breaking the chunks of ice off my knuckles with a toffee hammer—I keep knitting. As you will see from the pictures I’m now halfway through my third diamond. As expected, the zigzag and diamond combination won’t quite end in sync, so I’ll have to resort to one of the cunning stratagems I’ve been preparing. You should’ve gotten some fishing line when the boats were going out of the harbour. Plan ahead! My extra hour always seems to be used up by my staying up late. Tell Margaret the lace is beautiful. Is the white swatch her own pattern? Thanks for the kind words. 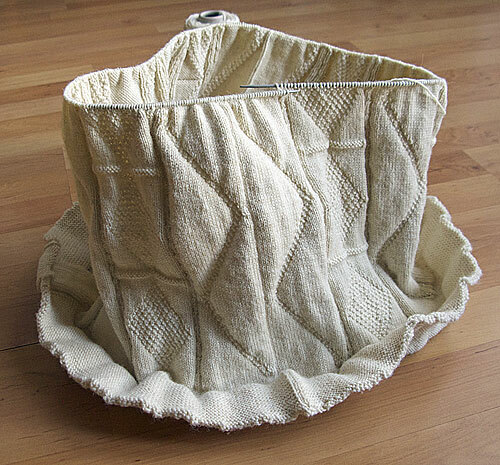 The white swatch (which is about 31″ wide) is indeed of my own devising, based on patterns in Sharon Miller’s Heirloom Knitting . I thought it was about time I tackled a Shetland shawl. Oh my! Margaret, your lace work is beautiful. I’ve never been very good at it – I lose track of whether I should be doing k2 tog or s1psso and whether the yrn/yon is before or after. I recently found yet another UFO (unfinished object) which when I opened the bag turned out to be 3/4s of the Shetland lace christening shawl I started for my Goddaughter 3 house moves ago. Said Goddaughter turned 30 last December and emigrated to Australia in the Spring! If I can work out which line to re-start the pattern with then I might stand a chance of finishing it in time for the birth of her first baby. Not due any time soon you understand, but if I wait until she announces that she’s pregnant then with my track record the odds are that it won’t be finished before the child starts school! PS Gordon, the gansey’s looking pretty nifty too! Just downloaded Wraiths and will start reading after the storm (H. Sandy) passes and I stop watching the TV for weather reports. Nat, in Snow Hill, MD, is getting a lot of rain. We are just windy with gusts and rain. Halloween! My sentiments exactly, Gordon, you couldn’t have worded it better! And, thanks again, for the Wraiths, I’m tempted not to read it (again) until the sequels . . . however, it’s a good read for the season. The lace knitting is exquisite, Margaret, I did a lace shawl once a couple years ago, just to prove I could, but dropping a y.o. is so challenging for me that I quickly returned to my gansey. Very nice work to both of you! I’ve dabbled in basic lace but nothing as complicated as yours, Margaret! Working on knitted watch caps for Canadian troops overseas has me not even thinking about ganseys yet. Maybe next year… Ooops! That’s thinking like the farm kid taht I am! I agree — very nice work, you two. Love the blue shawl; perfect spikiness for Halloween. 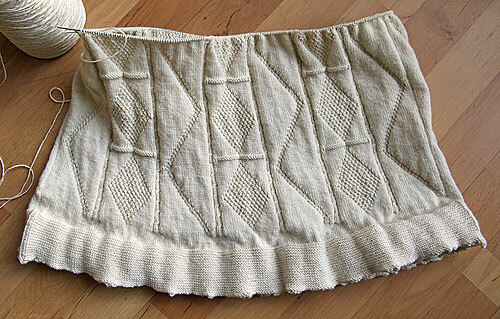 Did you plan for the white shawl and this gansey to have related patterns so that Margaret can wear both together? Margaret, what is the pattern about? I see people and Mexican pyramids but then most things look a bit Latin American to me. Comes from growing up in Los Angeles (aka the capital of Northern Mexico). Then again, coming from LA (the land of the weird), my second guess is that those are Martians/elves and daleks. Margaret, that blue shawl is gorgeous! I’ve avoided lace because the blocking intimidates me. Ghoulish greetings to Gansey Nation! I see many layered cakes in the white swatch, cake and extraterrestials. Could be a story there, Gordon. 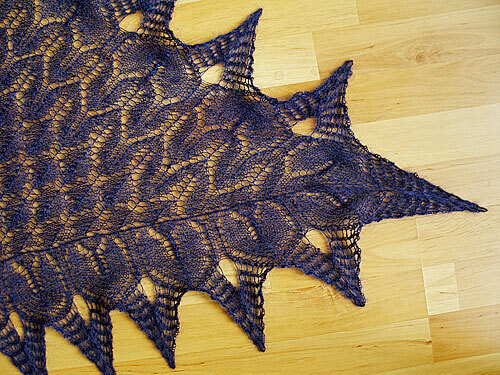 Lovely work Ms. M. I’m looking forward to seeing the completed Shetland shawl. Beautiful lace, especially the white one. Just got Wraiths on my pc, so will read it over the next few days. Thank you. Hello everyone & many thanks for the kind words. 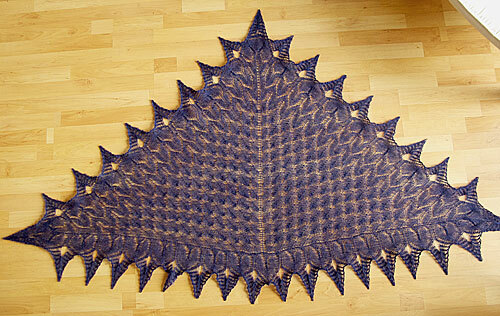 The blue shawl, is ‘Winter Thaw’, available for free on Ravelry. Sue – knitting lace from charts is the only way to go! That way you can easily see where the yos and decreases are. Lynne – I’ve seen ‘lifelines’ recommended many times, but am too indolent to use them. The thought of threading tons of stitches onto a thread, just in case I make a mistake, sounds like more work than it’s worth. I expect I’ll be eating my words later when I get further into the project! Sue G – lace blocking is indeed a pain in the back, which is why the shawl sat around for a few weeks before I blocked it. However putting the blocking surface on a table instead of crawling around on the floor made it a lot better. I’m considering investing in blocking wires. Veronica & Marilyn – TBH I would never have thought of pyramids, daleks or cakes! The upward pointing triangles are supposedly ‘feathers’, though to me they are a lace version of a gansey ‘tree of life’. The fill pattern inbetween has no specific name but I think of them as scent bottles. They are topped by paisley ‘sprouting seeds’. 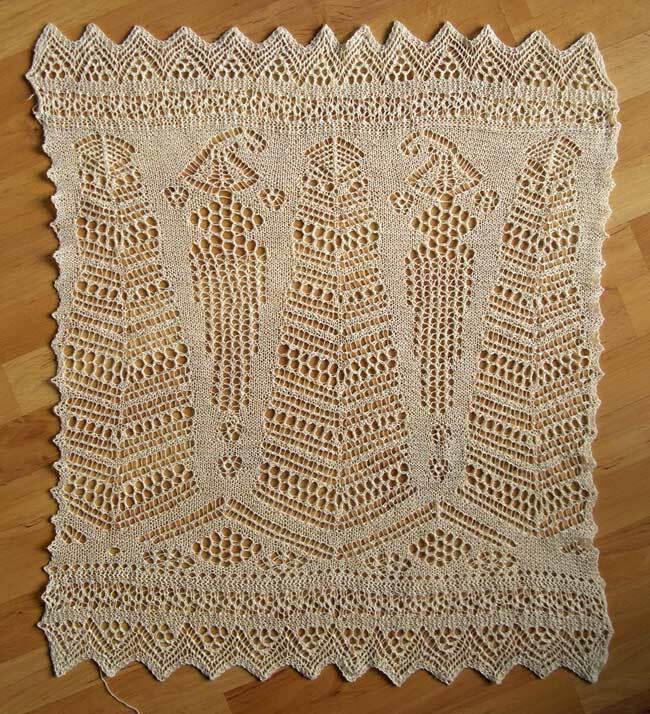 All are traditional Shetland shawl motifs. What lovely work! Most impressed with the lace, I’ve become a big fan though I do have a “summer” lacy cotton sweater languishing in a bag somewhere as it takes forever and missed the 5 days of summer we actually got. Keep up the good work! Goodness, you get wiped out with a migraine for 24 hours and when you look at the website again you find it’s full of comments! Halloween, eh? 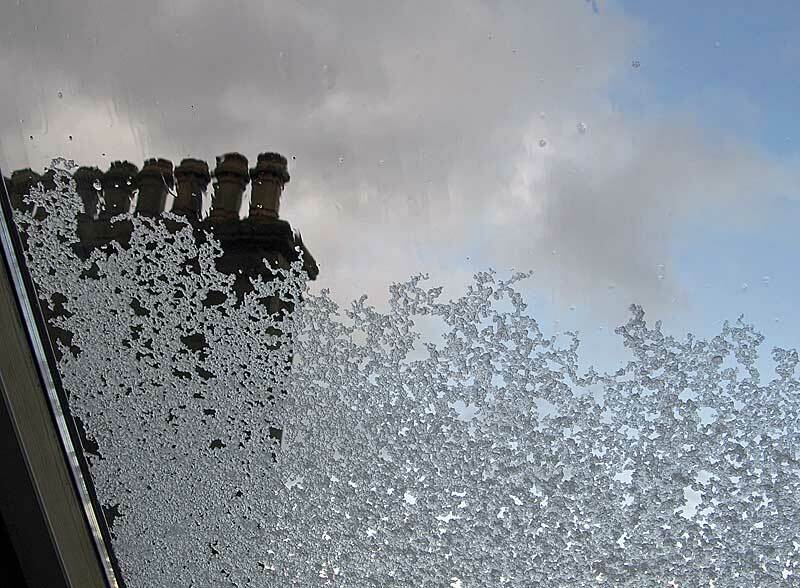 I’ve just been wiring the front doormat to the mains and soaking it in brine, just to tickle the little blighters up, you understand, wake them up, nothing fatal, but it’s 7pm and no callers yet. I’ll probably forget, go out tomorrow and electrocute myself (see Wile E Coyote, above). We’re set back from the road and usually in total darkness, but the next-door neighbours have let the side down by turning on their front light, showing a light to tempt enemy aircraft, sixth columnists that they are. Mind you, I have laid by some doggie treats specially for callers, so we can play this either way. Gail, hope you survived Sandy unscathed on the Cape, the pictures we saw went from exciting to terrifying, so fingers crossed. And to everyone, good wishes for a happy Halloween, mwahahaha.